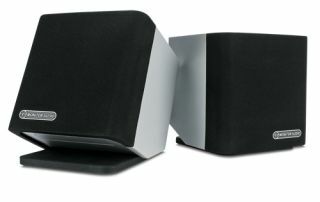 Monitor Audio launches WS100 wireless desktop speakers | What Hi-Fi? After years of expertise in the hi-fi world and a foray in to portable audio with the successful i-deck range of iPod docks, Monitor Audio has announced its first wireless desktop speakers, the WS100. Taking the form of two desktop cubes, the Monitor Audio WS100 speakers connect wirelessly to any PC or Mac using a bundled USB dongle wireless transmitter, which has a range of up to 10 metres. Further dongles will allow you to send audio from up to four audio sources to one set of speakers, while you can also connect up to four pairs of WS100 speakers for a basic multiroom system. The WS100 speakers use SKAA wireless transmission technology, operating in the the 2.4GHz band, and promising to deliver audio "without compression". It uses a patented wireless protocol called Walking Frequency Diversity to avoid conflicts with other devices in what is after all a pretty crowded part of the radio spectrum. Each cube speaker has a 7.5cm mid/bass driver driven by a 20W amplifier, plus a 19mm tweeter with its own 10W amp. The amplification is Class D, while the drive units are of Monitor Audio's familiar C-CAM (ceramic-coated aluminium/magnesium alloy) construction. The right speaker acts as the master for the pair, having the power input, wireless receiver and a 3.5mm input for external analogue devices, and connects to the left speaker via a multipin umbilical cable. Volume control buttons are provided on the right speaker. There's also a smart WS100 remote control to take care of power, play/pause, track up/down, volume and input selection. Each speaker has die-cast enclosure with a scratch-resistant polished glass top panel and a black grille, plus a 'unique magnetic pivot system': this allows the speaker to be tilted backwards, so it will give the best sound whether on a shelf firing forward or down on a desk firing up. The Monitor Audio WS100 wireless speakers are due on sale this month, and will cost £250.